Clearly the amount of bicycling in Missouri cities, and U.S. cities, and world cities is growing quite substantially over time. But just as clearly, Missouri cities are lagging behind the U.S. cities in bicycling--and very far behind the best bicycling cities in the U.S. and the world. It is just as clear that the best bicycling cities in the U.S. are clearly trailing the best world cities for bicycling by a very subsantial margin. In fact, our very best Missouri cities (Columbia in 2017, and Columbia, Springfield, and St. Louis in 2014) are--at best--comparable with the average U.S. city for bicycling. They are far, far below the BEST U.S. cities for bicycling. By the same token, the very best U.S. cities for bicycling and barely comparable to--in fact just below--the AVERAGE of 326 world cites in the 2014 data. And the very best U.S. cycling cities are very, very far below the best world cities for bicycling. But by the same token, the growth in bicycling U.S. cities and world cities has also been very substantial. So even though Missouri cities have a LOT more bicycling now than they did a few years ago, Missouri cities are still lagging behind U.S. and world cities--because those cities have increased even more. Why such large disparities between world, U.S., and Missouri cities? The reason for the disparity has a lot to do with the history and--because of that history--the varying amount of bicycle facilities in the various cities. The best world cities for bicycling started building substantial bicycle networks in response to the global oil crises of the 1970s. So they have been working on this for 40 years and sometimes more. The leading U.S. cities for bicycling started serious work on the issue in the 1990s. The leading Missouri cities--Columbia, St. Louis, and Springfield--started building out their bicycle systems in the early 2000s, a good ten years later than cities like Portland, Minneapolis, and Salt Lake City. That simply means that our bikeway systems in Missouri cities are about 10 years behind those of the best U.S. cities and 30 years behind the best world cities. This disparity is shown most clearly by the case of Kansas City. In 2007, Kansas City still had not started to build its bikeway system. In fact, 2007 was the year the BBC declared that Kansas City was the worst U.S. city for bicycling and sent a news team to investigate (U.S. Census Data that year showed that Kansas City was 50th out of the 50 largest U.S. cities in the percentage of bicycling). So in 2007, Kansas City was far behind world cities, U.S. cities, and all of the Missouri cities that had started work on their bikeway system 5-10 years earlier. However, between 2007 and 2014, Kansas City started to build out its bikeway system--and you can clearly see the results in the 2014 data. But you can also see that--although KC made major gains from 2007 to 2014--the city is still noticeably behind the other Missouri cities that had the 5-10 year head start. All this confirms one of the most well understood aspects of bicycle planning: When people have a safe place to bicycle, they bicycle more--far more. When there is no safe place to bicycle, of course they don't. The more complete, connected, comprehensive, and safe your bikeway network is, the more people will use it. The best world cities for bicycling have a very complete, connect, comprehensive and safe bikeway system. So many, many people use bicycling as basic transportation daily. Back in the early 2000s, Missouri cities had very few safe bicycling options, so very few people bicycled. Now our options are getting much, much better so far more people are bicycling. If we improve our local, regional, and statewide bikeway networks even more, then even more people will choose to bicycle. That is an economical investment, and investment that will pay off both in transportation benefits and health benefits for the state. And--as the chart above makes very clear--it is an investment we need to make as a state to remain competetive on both the national and an international playing fields. For European Cities: CityClock.org, bicycling mode share data. A small selection of U.S. and World cities are shown on the graph to give an idea of what some of the very best cities for bicycling look like, what some more 'moderate' cities look like, and what the average of a large number of cities looks like. For far more comprehensive comparisons of bicycling and walking data in many U.S. cities, check out the Alliance for Biking and Walking Benchmarking Report. 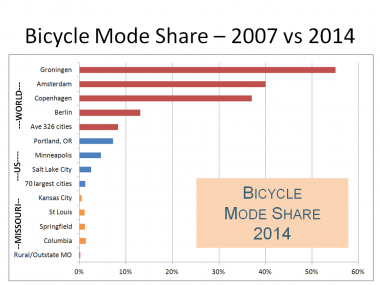 Note that U.S. data is bicycle commuting mode share, whereas world data is overall bicycle mode share. These are different things, and a concern is, that perhaps they are not directly comparable. 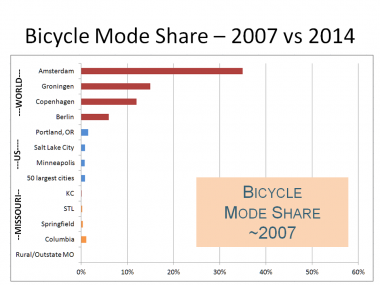 Unfortunately, bicycle commuter mode share is the the best (and really, only) comprehensive data set we have for numerous U.S. cities over time. Fortunately, research indicates there is a relatively strong correlation between bicycling commuting mode share and overall bicycle mode share. The differences would make it difficult to make really persuasive fine-grained comparisons among U.S. and world cities, but here we are making the Big Picture argument that numerous world cities (and even the average of 326 major world cities) have bicycle mode share equal to or greater than that in the best U.S. bicycling cities--and for that, the existing data is clearly sufficient. 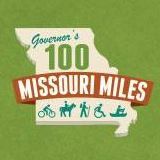 Working to build a world-class bicycle and pedestrian system in Missouri is one of the four major goals of MoBikeFed's Vision for Bicycling and Walking in Missouri. Your ongoing membership and generous financial support helps turn our Vision into reality! We are currently working on our Annual Campaign to fund our advocacy work for 2018--and your membership renewal or contribution will be TRIPLED by two groups of generous donors.